We give new meaning to “swipe to pay.” No more fiddling for change, ironing bills, or rubbing your card’s magnetic stripe on your jeans. 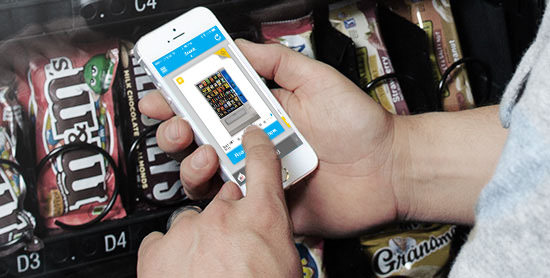 When in PayRange, or about arm’s length from the machine, the App automatically connects to the machine and the user simply “swipes” on the smart phone to pay. No personal information is sent to the machine and credit card numbers are managed securely by a PCI compliant processor. We never see or store credit card numbers on our servers. Adding funds to a PayRange App is easy. Use all major credit and debit cards plus users can now add funds via Apple Pay. And with all funding options we never see or store credit card numbers on our servers. It’s easy to get started. Here’s how. Download the free PayRange app. Add funds via credit card, debit card or Apple Pay. Funds can be used on any PayRange machine. When you’re in front of the machine, launch the PayRange app. send payment. Complete transaction on machine.